(AP) LOS ANGELES - Swept by the barefoot running craze, ultramarathoner Ryan Carter ditched his sneakers for footwear that mimics the experience of striding unshod. While some runners completely lose the shoes, others opt for minimal coverage. The oxymoron "barefoot running shoes" is like a glove for the feet designed to protect from glass and other hazards on the ground. Superlight minimalist shoes are a cross between barefoot shoes and traditional sneakers - there's little to no arch support and they're lower profile. Greg Farris decided to try barefoot running to ease the pain on the outside of his knee, a problem commonly known as runner's knee. He was initially shoeless - running minutes at a time and gently building up. After three months, he switched to barefoot running shoes after developing calluses. 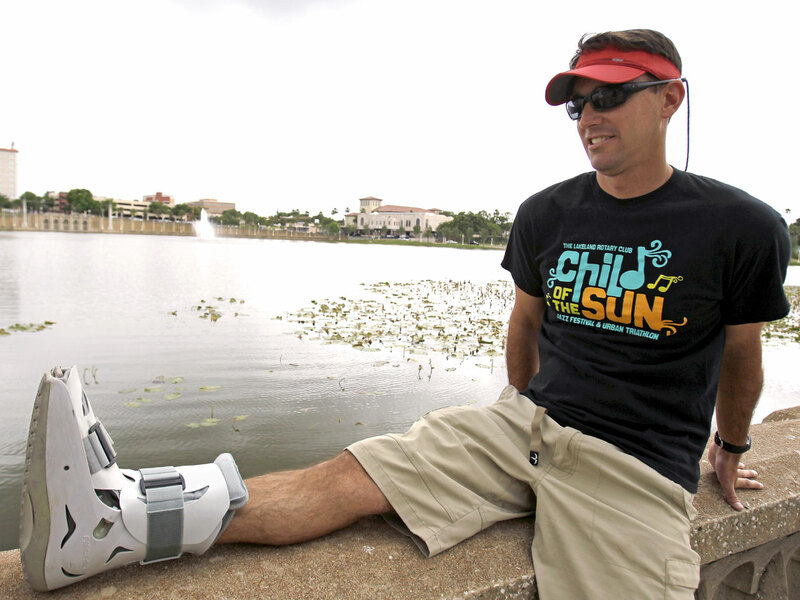 Farris was in a foot cast for three months. He recently started running again - in sneakers. A year and a half ago, Ross saw a steady stream - between three and six barefoot runners a week - with various aches and pain. It has since leveled off to about one a month. Harvard evolutionary biologist Daniel Lieberman runs a lab devoted to studying the effects of running form on injury rates. He thinks form matters more than footwear or lack of - don't overstride, have good posture and land gently. "The long and the short of it is that we know very little about how to help all runners - barefoot and shod - prevent getting injured. Barefoot running is no panacea. Shoes aren't either," said Lieberman, who runs barefoot except during the New England winters. In April, he ran his fourth 100-mile race - with shoes. Meanwhile, his pair of barefoot running shoes is collecting dust in the closet.